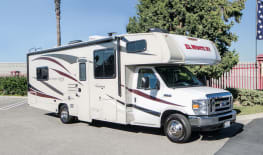 Mighway makes it easy to rent an RV in Arizona. Hire a campervan and start enjoying the sheer beauty of the Southwest. From the Grand Canyon to Lake Powell and more. Arizona is one of the most popular places to travel and move to, and with very good reason. The weather is beautiful all year round, there are businesses that constantly open and create opportunities for aspiring workers, and communities are always flourishing with next to no signs of an economic decline. People and families from all kinds of backgrounds yearn to take advantage of what The Copper State has to offer. Arizona is full of numerous visual marvels, and there is never a shortage of wildlife parks and landmarks to explore. No matter where you look, you are sure to see environment that grabs your attention and will not let go. There are many different great places for tourists to visit in Arizona, but imagine having an RV or motorhome right by them. To see a collection of colorful cacti and other desert plants, visit Desert Botanical Garden in Phoenix. Take one of many trails featuring numerous exotic cacti, flowers, herbs and other plants. You can also take a peculiar tour of the garden's butterfly exhibit and watch a classic movie underneath beautiful night skies. Over 30 thousand plants are for sale at this garden, so you can be open to the idea of taking a piece of Arizona home with you. The Herberger Theater Center is located in downtown Phoenix, where tourists can enjoy a musical, play, improv, concert or opera taking place. This is a non-profit venue designed to bolster the growth of performing arts in Phoenix area. You can fly to Europe to experience the most traditional forms of entertainment imaginable, or you can simply go to Herberger to provide you with amusement that only the city of Phoenix can. Tucson is home to one of the world's biggest space museums called the Pima Air and Space Museum. Over 300 different aircrafts span a whopping 80 acres, featuring historical planes such as the Boeing B-17 Flying Fortress and the Martin PBM Mariner. If you have a thing for history or aircrafts, visiting this museum should be on the top of your list. If the idea of travelling in Arizona intrigues you, hire a campervan with Mighway, and let the journey unfold! Perfect Hybrid Trailer for Restful Camping!